Moxie Knowledgebase is an always-accessible knowledge platform that can help your customer service representatives resolve issues expeditiously and make consumers happy with their swift responses. Moxie Knowledgebase has a simplified content authoring workflow that you can configure to suit your business’s work processes. The solution has a WYSIWYG editor that lets you edit visually without the need for code-level modifications. Moreover, Moxie Knowledgebase has a renowned reporting functionality that customers and industry analysts alike have commented on positively. Thus, you can rest assured that statistics and insights you get from the software are actionable and in-depth. Building an internal knowledgebase can be expensive. However, you can minimize the IT costs with Moxie Knowledgebase. The solution has a user-friendly web browser-like interface that administrators and content managers can seamlessly navigate. As such, there is little need for you company’s IT department to be involved in the project. When your knowledge repository has grown in volume, it becomes trickier to manage. Fortunately, you can manage it and apply changes across the board with ease and in a short span of time. Moxie Knowledgebase has bulk-editing tools for sweeping changes to security settings, metadata, and taxonomies that let you finish in a matter of minutes. Having an accessible knowledge repository allows you to deflect calls from your call center service. With Moxie Knowledgebase, you can create a portal where end-users can find information to resolve their issues. With a sophisticated information base, your representatives can solve more problems in a short while. That is because Moxie Knowledgebase simplifies the search process and provides users with data they need expeditiously yet accurately. Your business undergoes changes at a fast pace. Therefore, your knowledgebase also needs to reflect those modifications as soon as they happen so you can continue providing updated information to end users. Moxie Knowledgebase makes it easy for subject matter specialists to modify contents when needed with content expiry dates. On top of that, the solution has a feature that allows content managers to publish articles at a future date when it becomes relevant. Knowledge repositories require constant changes and management. Moxie Knowledgebase assists you in that with its powerful reports that allow you to measure article retrieval satisfaction, provide you with insights as to the most searched items, the rate of ROI, and more. The information you gain can offer ideas on how you can improve employee training, customer support, and knowledge base content. 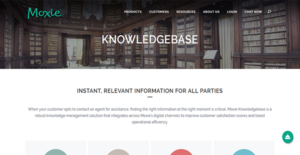 If you are considering Moxie Knowledgebase it might also be a good idea to examine other subcategories of Best Knowledge Management Software collected in our base of B2B software reviews. Since each organization has specific business wants, it is sensible for them to desist from looking for a one-size-fits-all faultless software solution. Needless to say, it would be futile to try to find such a platform even among widely used software applications. The intelligent thing to do would be to list the various vital factors that require consideration such as required features, finances, skill levels of workers, company size etc. Then, you should do your groundwork thoroughly. Read some Moxie Knowledgebase reviews and look into each of the other apps in your shortlist in detail. Such comprehensive homework can make certain you reject ill-fitting applications and zero in on the app that provides all the aspects you require for business success. How Much Does Moxie Knowledgebase Cost? Moxie Knowledgebase is a robust knowledge management software that places information at the fingertips of your support representatives. To enhance your agents’ assistance capabilities with this software, you can request custom enterprise pricing from the sales team by phone, email, or web form. We realize that when you make a decision to buy Knowledge Management Software it’s important not only to see how experts evaluate it in their reviews, but also to find out if the real people and companies that buy it are actually satisfied with the product. That’s why we’ve created our behavior-based Customer Satisfaction Algorithm™ that gathers customer reviews, comments and Moxie Knowledgebase reviews across a wide range of social media sites. The data is then presented in an easy to digest form showing how many people had positive and negative experience with Moxie Knowledgebase. With that information at hand you should be equipped to make an informed buying decision that you won’t regret. What are Moxie Knowledgebase pricing details? What integrations are available for Moxie Knowledgebase? Additionally, Moxie Knowledgebase gives you access to its API for further customization functionalities. If you need more information about Moxie Knowledgebase or you simply have a question let us know what you need and we’ll forward your request directly to the vendor.